The month of October never ends without at least one old ghost story being told. So, i thought i would add one more story to the undead pile. Over the years i had always heard various versions of a ghost story surrounding an interurban train wreck. Interurban railroads were electrically-powered-line trains that connected communities together and provided fast, cheap, mass transportation for many people who were still using a horse and buggy to get around. 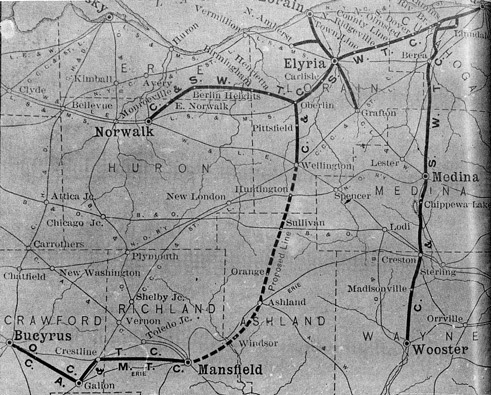 Wooster became part of the Cleveland & Southwestern Traction Company’s western division, also known as the “Green Line”, that eventually connected the communities from Cleveland, Berea, Elyria, Lorain, Wellington, Oberlin, Norwalk, Grafton, Medina, Seville, Wooster, Ashland, Mansfield, and Bucyrus. The story i heard variations of was that interurban train operators on their way to Wooster dreaded passing through a treacherous stretch of tracks where they would report seeing a man holding or swinging a lantern on the tracks ahead just before a bridge crossing and they would slow, or completely stop, thinking something was wrong, but then the man would disappear. Another variation was that the motormen would round a “death curve” and see a bright light on the tracks ahead coming over a bridge and would think it was another train coming right at them and would slow or slam on the brakes only to see the bright light vanish. It was said that you can still sometimes see the phantom man and/or light on the road where the train line used to run and that it caused many automobile accidents as people slammed on their brakes to avoid what they thought was a man or oncoming traffic. Circa 1903 Cleveland & Southwestern Traction Co. train lines map. I always thought this happened somewhere in Wayne County, somewhere along the roads where the old “green line” trolley train used to run. Problem was nobody could ever tell me where the treacherous tracks and/or “death curve” and bridge was located; only that i would discover it when i saw the phantom man and/or his light while traveling the road where the train used to run at night. In all my travels across Wayne County I never did see any phantom man or light on any road. Old maps that i reviewed for the electric train line never appeared to have any “death curves” near a bridge in Wayne County. It seemed like a pretty straight shot down the old track line from Berea to Wooster. However, there always seems to be a teeny, tiny, grain of truth to any good ghost story and perhaps this old story from the Wooster Weekly Republican dated January 27, 1904 p.5 explains the origins of the phantom man/train ghost story i had heard over the years. The ghost story must have traveled down the train tracks to Wooster via the passengers or was retold countless times by the motormen in our city’s old interurban car barns, once located on the northeast corner of W. Liberty and Grant streets, to the point that it got muddled and confused and became a part of Wayne County folklore, but in reality was a forgotten Lorain County ghost story. Motormen coming into Wooster on the trolley line state that the western division of the Cleveland & Southwestern Traction Company’s lines is in the grasp of a ghostly apparition that threatens to make the Cottesbrook (Farm) curve a spot of superstitions dread to motormen employed by the company. On the Cottesbrooke curve on the night of July 19 last E. L. Garvin, of Oberlin, lost his life in a terrible trolley wreck, and it is stoutly maintained by one of the motormen of the division, who is seconded in his assertions by two section men, that an apparition haunts the scene of the tragedy. Author’s best guess as to the location of the July 19, 1903 interurban train wreck that happened roughly 2 miles southwest of Elyria, Ohio. Click image to enlarge. So great has become the dread of the spot since the section men were recently driven in terror from the curve by the ghostly appearance of a rapidly moving car, and the ghostly re-enactment of the dreadful event of last July that heroic efforts are to be made to unravel the mystery. Nearly a month ago, says the Cleveland Leader, in telling the story, the apparition first terrified a motorman on a late car. While nearing the curve and bridge at a good speed the motorman says he was startled to see a shadowy figure standing in the middle of the track but a few feet from the bridge. Fearful of running down some nocturnal track-walker, he slackened his speed and blew the whistle severa times. The form moved, he avers, and the car was almost at a standstill when the curve was rounded and the glare of the headlight revealed a clar stretch of shining rails and ties ahead of the car. The form had vanished when the light struck it. Fearful of ridicule, and not yet satisfied himself that his eyes had not played him false, the motorman kept his story to himself. Several nights later, on the same run, the ghostly form again blocked his way on the same spot, he says, and the appearance was several times repeated. Fully convinced by this time that the curve was haunted by the ghost of the man whose life had been so quickly extinguished on the fatal July night, the motorman, nevertheless, was dumb as to his experience. Last week, however, he told his story in corroboration of a harrowing tale told by two terrified brakemen. Early in the evening on a snowy night a week ago they had been sent out from the powerhouse to keep the tracks clear on the Cottesbrooke curve, and while engaged in sweeping the tracks heard the sounds of a rapidly approaching (rail) car. Both stepped back from the track to await the passing of the car. They could hear it approach. Nearer and nearer it came they claim, until its deafening noise was upon them, but no car was to be seen. No headlight broke the gloom of the whirling snow and no car flashed by them with its windows alight, they said. Not a thing came out of the snow ahead of them, but the noise of rapidly moving car was plainly heard rushing by them, they said, until with a terrible crash, like the meeting of two cars, the noise of the onrushing car ceased. A cry, of a human being in mortal anguish, followed the crash, they averred, then all was still as death. Standing for a second petrified with fear, the men gazed at one another, dropped their brooms, and in headlong flight stumbled over the tracks to the powerhouse. Arriving there in the safety of the lighted powerhouse, with eager men crowding around them, the two section men, between gasps of horror, as the awful cry reverberated in their ears, told their story. They were laughed at and ordered to return to their work. But neither laughter nor threats could induce them to go back to the curve. Their terrified glances behind them and the horror that looked from their startling eyes finally broke down the scoffing of their comrades, and when the motorman, who has previously been the only one to whome the apparition had appeared, maintained the truth of the ghostly invasion of Cottesbrooke curve, consternation seized upon the mind of the trolley men. Although some few still scoff, the majority of the men on the division dread the spot, and teh night crews past the curve with with bated breath and swelling heart, fearful of another visitation of the terrible apparition. Small article on front page of the Wayne County Democrat newspaper dated July 22, 1903. 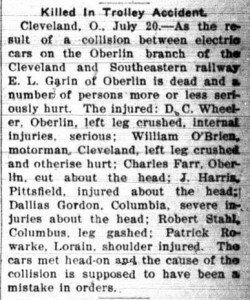 Newspaper reports from Elyria after the crash reported that two cars on the Cleveland and Southwestern electric line came together in a horrific head-on collision near the Cottesbrook farm two miles southwest of the city. The two cars involved were completely telescoped, but remained on the track. A surviving passenger said that he was sitting directly behind the motorman and could look over his shoulder. He said the other car could not be seen on account of the trees lining the curve, and that he was not aware of any danger until the motorman suddenly leaned forward and attempted convulsively to stop his car. The next instant he caught a glimpse of the other car emerging from the bridge and in another moment they were together. A man by the name of E. L. Garin was instantly killed in the crash and somewhere between 20-50 people were injured. One other person was supposed to have died later from injuries sustained in the crash but a name for that person could not be found. 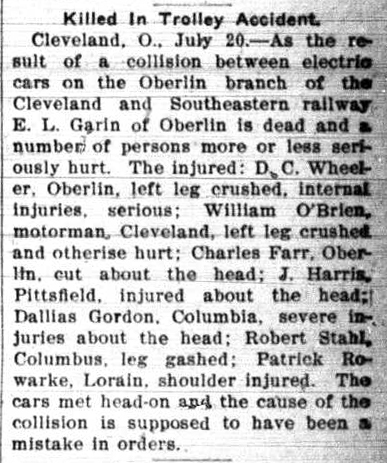 Wooster area newspapers had only one small article about the Elyria wreck in July 1903 that downplayed the number of injuries. It is likely they did not want sensationalize bad press for what was then a new electric train line in Wooster: don’t want to scare-off people from riding the new train line. Why the two cars “telescoped”: where one car practically drove through the other and became embedded into it was explained by the fact that one of the cars was a newer train model and was heavily built while the other car was one of the old pattern, with a smoker on the front end. It was determined that the wreck occurred because of human error: there was a misunderstanding of orders transmitted by way of a telephone call to the switching station that allowed an eastbound train onto the same track the westbound car was traveling. The resulting head-collision was so bad that one of the trolley cars involved in the crash had to be scrapped, but it was reported that in April of 1904, “car 99” was returned to service and looked as good as new. But did it ever escape it’s history of horror? Perhaps the ghost of E.L. Garin still haunts the place of his death, but it’s not located anywhere in Wayne County. You’ll have to take a road trip to Elyria in Lorain County to find this old ghost.